As a part of the acclaimed DC Comics -- The New 52 event of September 2011, writer and co-creator of the CW show Supernatural Adam Glass rolls out an all-new team of death-row super villains recruited by the government to take on missions so dangerous-they're sheer suicide! 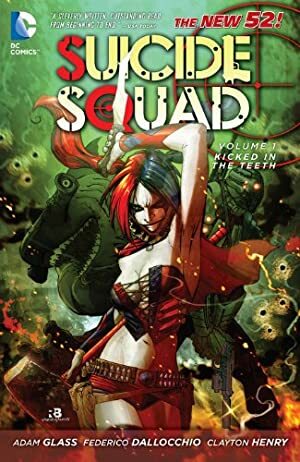 The story begins with the Suicide Squad defeated, imprisoned and being interrogated about their newest mission. Harley Quinn, King Shark, Deadshot and company must make it out alive without revealing who's pulling the strings behind their illegal operations. Who will be the first to crack under the pressure? More importantly will they make it all out alive? Track It. This book has been $4.99 within the past year. Log In to track Adam Glass on eReaderIQ. to be notified each time the price drops on any book by Adam Glass. to stop tracking Adam Glass. Log In to track Frederico Dallocchio on eReaderIQ. to be notified each time the price drops on any book by Frederico Dallocchio. to stop tracking Frederico Dallocchio. Log In to track Federico Dallocchio on eReaderIQ. to be notified each time the price drops on any book by Federico Dallocchio. to stop tracking Federico Dallocchio. We started tracking this book on December 28, 2012. This book was $9.68 when we started tracking it. The price of this book has changed 203 times in the past 2,302 days. The current price of this book is $9.99 last checked one minute ago. This lowest price this book has been offered at in the past year is $4.99. The lowest price to date was $0.99 last reached on December 11, 2013. The highest price to date was $11.99 last reached on January 29, 2018. We last verified the price of this book about one minute ago. At that time, the price was $9.99. This price is subject to change. The price displayed on the Amazon.com website at the time of purchase is the price you will pay for this book. Please confirm the price before making any purchases.